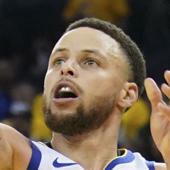 Curry totaled 36 points (12-21 FG, 8-14 3Pt, 4-5 FT), five assists, three rebounds and two steals across 33 minutes in the Warriors' win over the Timberwolves on Tuesday. Curry made it rain in Tuesday's win, totaling 24 of his game-high 36 points on eight made threes. Arguably the best shooter in NBA history, Curry is almost unstoppable when he gets the hot hand. That seems to be the case now, as he's drained 19 threes over his last three games while averaging 31.3 points. Incredibly, this was Curry's ninth game with at least eight made threes this season.